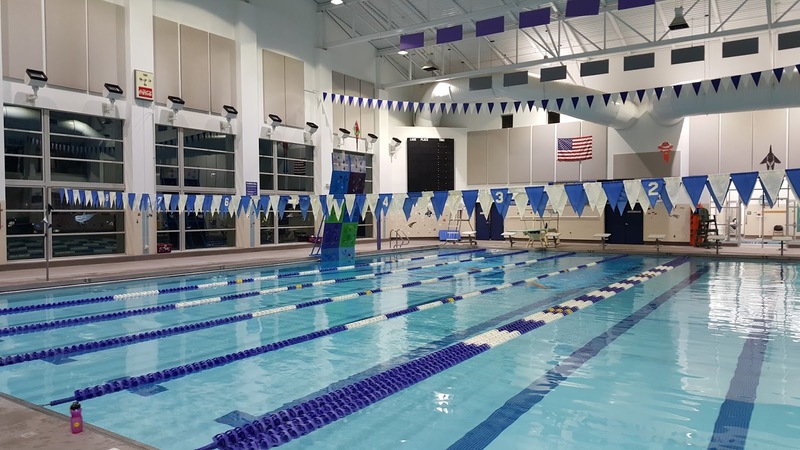 I was working in Cody, WY the other day and swam at the Paul Stock Aquatic and Recreation Center. For such a small community, this is a really nice facility. This is a really nice facility. Notice the climbing wall in the far left lane. There was a workout written up on a whiteboard on deck and I decided to just swim that workout. At the end of the workout, I decided to do my second Swim Smooth "How Far Can You Go" Challenge. On my first test, I made it 150 yards at my challenge pace of 17 seconds per 25 yards. I felt slow during the workout and wondered if I could even go 150 yards again at my challenge pace. I set my tempo trainer to 17 seconds and set off. At 150 yards I was still on pace. I made it to 175, still under pace, but was getting tired. I was so close to getting 200 yards, but my tempo trainer beeped just barely out of reach of the wall. I was happy to see an improvement over my last test. Next time I'll get 200 yards! Josh - My niece swam for Cody High and worked at that pool for years. I've swam in that pool for a triathlon I did with her a few years ago. Just FYI: Apparently the little town of Pinedale Wyoming has the most amazing pool facility in the state. But you are right about Cody, they have a great rec center. Cody is such a cool little town. I want to swim across Fremont Lake, which is right by Pinedale. I'll be sure to check out their pool when I do.